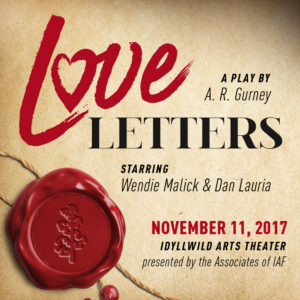 LOVE LETTERS, a play by A. R. Gurney starring televison, stage, and motion picture actors Wendie Malick and Dan Lauria. Love Letters is a funny and emotional portrait about the powerful connection of love. Two friends have exchanged notes, cards and letters with each other for over 50 years. From second grade, through summer vacations, to college, and well into adulthood, they have spent a lifetime discussing their hopes and ambitions, dreams and disappointments, and victories and defeats. But long after the letters are done, the real question remains: Have they made the right choices or is the love of their life only a letter away? Wendie Malick has appeared in several stage productions and motion pictures. A few of her televsion credits include: FRASIER, BIG DAY, MOM, JUST SHOT ME, and HOT IN CLEVELAND. Dan Lauria played the role of Vince Lombardi in the Broadway show: LOMBARDI. He has also appeared in the television series PITCH and the WONDER YEARS. LOVE LETTERS is presented by the Associates of Idyllwild Arts as a fundraiser for the Idyllwild Arts Academy and Summer Program Scholarship Fund. $50 VIP: SOLD OUT! 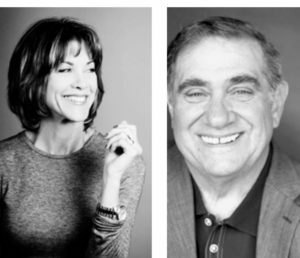 Preferred seating at front of house and a reception with Wendie Malick and Dan Lauria following the performance in the Parks Exhibition Gallery. Or you may mail a check payable to the Associates of IAF, PO Box 303, Idyllwild, CA 92549.